Among the Usual Days: What a Difference in 200 Years of Quilting! 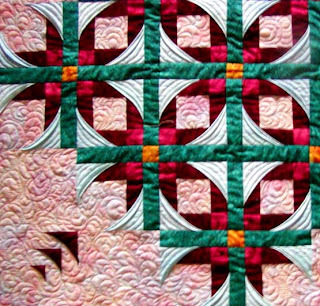 What a Difference in 200 Years of Quilting! I was just going through my pictures and noticed the contrast between a wholecloth quilt made about 1801 and a quilt I made a couple of years ago. What a difference! 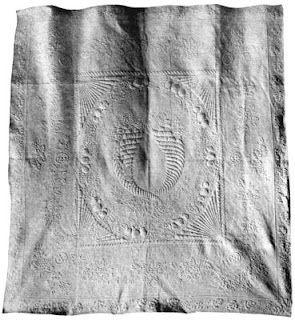 The beautiful hand quilted whole cloth quilt shown above is typical of those made by the well-to-do in early America. “What about the poor?” you might ask. "Didn’t they patch together scraps for quilts for bedding?" The answer is no, the poor slept under course, cheap blankets. Looking at this beautiful example of a whole cloth quilt you can see the hours, months and possibly years it must have taken to complete this masterpiece of fine needlework. Meanwhile we have this Mexican Star pieced quilt that I made for Quilt for a Cause just a little more than 200 years later. Rotary cutters make cutting and piecing easy. The sewing machine makes piecing quick work and free motion machine quilting makes the project go even faster. It’s almost beyond comprehension how quiltmaking has changed in 200 years.